At Satyaloka, Bhrigu rishi foundBrahma who was in meeting with Yamadev, Varundev, Aganidev and other god, discussing on some secret of the universe. Without notice to anybody Rishi Bhrigu entered in meeting but god Brahma not noticed to Bhirgu. At last Bhirgu concluded that Brahma was unfit for worship so he turned to Kailasha from Brahmaloka. When Bhirgu rishi went to kailasha, he found lord Shivaspending his time pleasantly with goddess Parvati and not noticing the rishi Bhrigu. 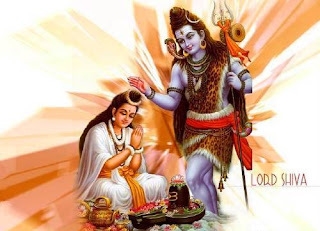 Parvati drew the attention of Shiva to the presence of the sage. Lord Shiva became angry at the interruption of Bhrigu and tried to destroy him. But the Bhrigu cursed him and turned to Vaikunth. The angry rishi Bhrigu went to Vaikunthdham. 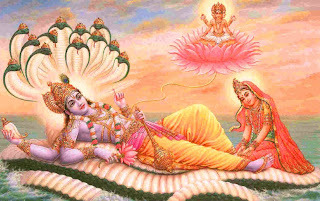 In Vaikunthdham, Lord Vishnu was sleep on the bed of the Adisesha and Goddess Lakshmi was respectfully nursing his feet. When Bhrigu Rishi saw this, he became full of anger, because he thought that Lord Vishnu was not really sleeping, but only pretending to sleep just to insult him.The sage was infuriated and he kicked to lord Vishnu on his chest, the place whereMahalakshmi resides. At once the Lord Vishnu hastened to the angrySage Bhriguand said “My Lord, my chest is the strongest thing in the world, like a mountain, but your feet are so soft. Maybe you got hurt while kicking me. So please forgive me for that.” Listening to this word of lord Vishnu, Sage Bhrigu got very calm and felt very guilty and he decided that God Vishnu was the most supreme of the trinity and told the Rishis the same. Therefore all rishis decided that Sri Vishnu was the fruit of the Yaga and sacrifice was offered to god Vishnu. At the beginning of the present Sveta Varaha Kalpa, the whole Universe was filled with water and the earth was immersed in it. Lord Vishnu took to form of a White Boar and dived into the water to lift the earth. He slew the demon Hiranyakshayap who caused obstruction to him and rescued the earth. Brahma and the other god extolled Sri Varaha at the time with the chanting of the Vedas and showered flowers on him for saving the Earth. Lord Vishnu decided to stay on Earth in the form of the White Boar for some time, to punish the wicked and protect the virtuous. This place then forward came to be known as Varaha Kshetra and Varaha Kalpa began from that time. After the departure of Mahalakshmi, Lord Vishnu left Vaikuntha and went to earth in the search of Mahalaxmi. Ultimately his quest brought him to the Seshadri hills where he stopped to rest in an anthill. Listening about the separation of Vishnu and lakshami, Brahma and Shiva got upset and decided to intervene. Thereafter Brahma and lord shiva took to form of cow and its calf and went to live at the place of a Chola king. The sun god informed to goddess lakshami about the plan of Brahma and shiva and requested her to sell the cow and calf to the king of the Chola country assuming the form of a cowherdess. The chola king bought the cow and its calf and sent them to graze in the Seshadri hills. 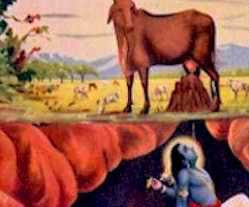 On this hill, the cow would secretly visit the anthill where Vishnu was living without sustenance. Emptying her milk, the cow would then return to the palace. The cowherd was angry because cow never yielded any milk to him. To find out the reason behind that, he watched movement carefully and his explorations brought him to the anthill. He discovered the cow emptying her under over the ant-hill. The cowherd got wild over the conduct of the cow, and he aimed a blow with his axe on the head of the cow. But the god rose from the ant-hill to receive the blow and save the cow. When cowherd saw the lord bleed at the blow of his axe he fell down and died. After the death of the cowherd, the cow returned bellowing to the presence of the Chola king with blood stains over her body. To find out the reason of the terror of the cow the Chola king followed her to the scene of the incident. Near an ant-hill, the King found the cowherd lying dead on the ground. While he stood wondering how it had happened, the Lord rose from the ant-hill and said “you are responsible for all this so, I cursed you to become an Asure (evil sprit) from the fault of your servant.” Entreated by the Chola king who pleaded innocent, then the lord Vishnu blessed him by saying that his curse would end when he was adorned with the Kireetam presented by Akasa Raja at the time of His marriage with Sri Padmavati. After giving the blessing to Chola king, Srinivasa (lord Vishnu) decided to stay in this Varaha Kshetra. Therefore, he requested Sri Varahaswami (the third incarnation of Vishnu as boar) to grant him a site for his stay. 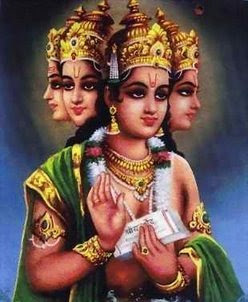 Varahaswamy was agreed with srinivasa request but he said that he (Sriniwasa) would tell his devotees to his shrine would not be complete unless it is preceded by a bath in the Pushkarini and Darsan of Sri VarahaSwami, and that puja and Naivedyam should be offered to Sri Varaha first.After that, lord Vishnu built a hermitage and lived there waited on by a devotee. Vakuladevi also lived with Sriniwasa and looked him like a mother. In a nearby kingdom of Varaha kshetra there was a king named King Akasha Raja. He was childless from many years. So, he decided to perform a sacrifice for obtaining an offspring. One day, he had found a beautiful baby girl sleeping on a golden lotus in a golden box while ploughing the fields. The king was so happy to find a child and he carried it to his place and gave it to his Queen to tend it. The Akasha Raja had named her Padmavathi. A beautiful and accomplished girl, Padmavathy had been granted a boon in her earlier birth that she would be married to Lord Vishnu. In course of time Princess Padmavati grew up into a beautiful maiden and was attended by a host of maids. One day while she was spending her time in a garden picking flowers with her maids, Sage Narada approached her. Assuring her that he was her well-wisher, he asked her to show him her palm to read her future. 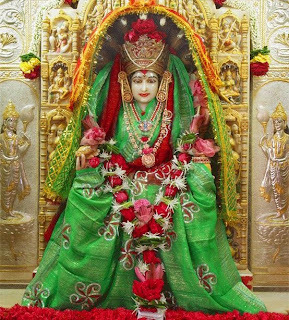 He foretold that she was destined to be the spouse of Lord Vishnu himself. At this time, lord Srinivasa went for hunting chased a wild elephant in the forests surrounding the hills. By the chasing of elephant, Srinivasa was led to the garden, where princess Padmavati and her maids were picking flowers. He was stunned by her beauty and drawn to her. She too seemed to be drawn to him, but the angry attendants thinking him a mere hunter drove him away. Lord Sriniwasa met with princess Padmavati and her maids. He had explained them about his birth and parentage. And he also enquired them about their princess and her parentage and birth. When he got the information that the princess was padmavati, the foster daughter of Akasaraja, he loved her and made advance to the princess. He was repulsed with stones by the maids and he urgently returned to the hills leaving the horse, which fell on the ground. As usual, Vakuladevi brought dinner to Srinivasa comprising various delicious dishes. But she found him lying on his bed love-sick. She asked to srinivasa the causes of his sickness. The lord srinivasa told her that unless he secured Princess Padmavati, he would not be well and also told her all story of padmavati’s previous birth and his promise to wed her. Listening to all this story, Vakuladevi thought that Srinivasa would not be happy unless he married Padmavati and she offered to go to Akasa raja and his queen with the marriage proposal. In the palace of Akashraja, the king Akasaraja and Queen Dharandevi beceme worried about the health of their daughter. They learnt about Padmavati’s love for Srinivasa of Venkata Hill. Akasaraja consulted Rishi Brihaspati about the propriety of the marriage and was informed that the marriage was in the best interests. Lord srinivasa doubted about the marriage of Padmavati with him. So, he disguised himself as a soothsayer and went to the court of Akasha Raja. The soothsayer saw the palm of the Princess Padmavati and told her that the hunter she had fallen in love with was no ordinary man but the incarnation of Lord Vishnu and told her that the worries would soon be over. After the departure of the soothsayer, Vakuladevi went to the queen and informed her that she came from Srinivasa with marriage proposal. After consulting with sage Brihaspati and heard from his queen about the prediction of the soothsayer and arrival of the marriage proposal from Srinivasa, Akasaraja accepted the proposal and decided to bestow his daughter on Srinivasa and he called the palace purohits to fix a suitable date for the marriage. Akasaraja informed his relatives and ministers and other Officials of his intention. Immediately a letter was drafted for being sent to Srinivasa requesting him to come and marry the Princess. After that king Akasha Raja send patrika to Srinivasa. After receiving the Patrika, Lord Srinivasa called for a conference of the Gods to win their consent for his marriage with Princess Padmavati. For the arrangement of the marriage, Srinivasa sought a loan of one crore and 14 lakh coins of gold from Kubera and had Viswakarma, the divine architect create heavenly surroundings in the Seshadri hills. As soon as day of the wedding arrived, lord Srinivasa was bathed in holy waters in pushkarini tank and dressed in jeweled ornaments befitting a royal bride groom. Then he set off in a procession for the court of Akasha Raja. In the palace of Akasha raja, Padmavathy waited radiant in her beauty. Srinivasa was hailed with an arthi and led to the marriage hall. 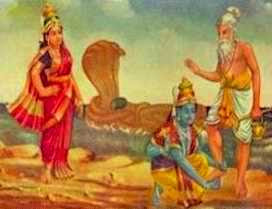 There the queen and King washed his feet while sage Vasishta chanted the Vedic mantras. Soon the wedding was over with all ritual and it was time for Padmavathy to take leave of her parents. After that Padmavati and Srinivasa went to venkatachala hill and live there with happily.